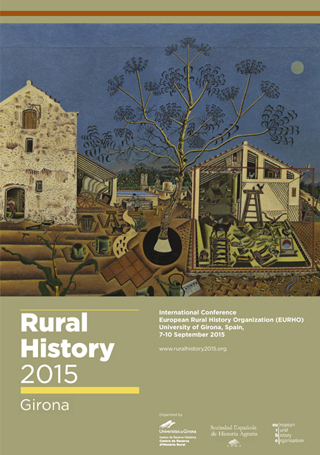 Entre el 7 y el 10 de septiembre se celebra en Gerona el Rural History 2015, el gran encuentro sobre la Historia Rural europea. Se puede visitar la página web aquí, y el programa completo en pdf aquí . Enric Guinot y Ferran Esquilache participan con la comunicación “Governing irrigation. The conflict between feudal power and collective management in the medieval and pre-modern Horta of Valencia”, que forma parte de la sesión llamada The management of natural resources in the medieval Iberian Peninsula. Common institutions?. Resumen: Traditionally, historiography has considered the irrigator groups in the huerta of Valencia as examples of self-managed communities, or instances of collective action. This was the perspective followed by Elionor Ostrom, who used them to illustrate the management of common-pool resources. According to Ostrom, communal institutions that manage to survive over time share eight characteristics in their design. It should be noted, however, that Ostrom did not study Valencian irrigation communities first-hand. In recent years, our growing understanding of the huerta and the management models followed therein has improved. It is, therefore, pertinent to examine whether the information with which Ostrom worked and, it follows, her conclusions about the reasons for the survival of the huerta of Valencia, remain valid. This paper will focus on the legal origins of these irrigation institutions and their internal form of organization; on the social origin of their members; and in whose hands ultimate control rested.